Crayon Box Quilt Studio: Done! Done! Done and Done!! Done! Done! Done and Done!! The final stitches on the binding on this year's Teacher Quilts were completed last night. Phew! I'm glad that is over. I'm so ready to move onto a new project. I just snapped this quick sneak peak on my back stairs. Today is going to be a nice day, sunny and warm, which will be a nice change from the rain and damp we've had too much of recently. I'll be able to get out and get a good series of pictures of each of these quilts to show to you in the coming days. I just couldn't resist sharing this next picture with you. I woke during the night at 2:30 am and though Sunshine had crawled into bed with me at some point, dear hubby wasn't there. I checked the house and realized that he must be out on a fire call. When I woke again a couple of hours later, Jammer had joined us girls in the big bed but hubs was still MIA. If he was still out on that call, he is going to be one exhausted pup later. I peaked into Jammer's room and found him fast asleep on dear son's bed, which isn't easy since he is 6'6" tall. Obviously he found that there wasn't much room left in our bed when he finally got home. Jammer woke about 45 minutes ago and asked where Daddy is. I told him and he disappeared. I went looking for him a little while later and this is what I discovered. 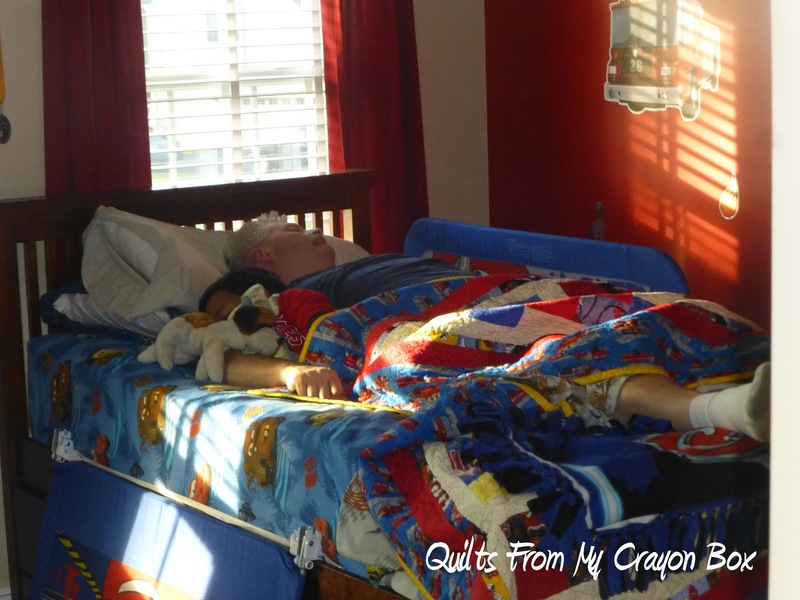 A grown man and a little boy cuddled together in a twin bed, snuggled under Jammer's Sound the Alarm quilt. Too, too cute! 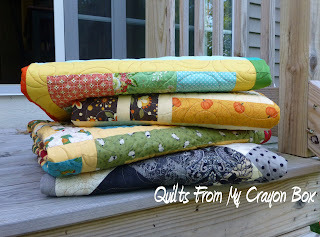 too cute... can't wait to see the finished quilts.... your husband goes on call from home? not a fire house? How cute! and congrats on getting the Teachers quilts finished. Cant wait to see pics. Now that is a photo to enlarge and frame! Congratulations on your finishing and look forward to seeing them in full view. Enjoy this sunshine today, I think we are in for more rain for a few days again. That is just so cute. What a moment to capture. Congratulations on finishing the quilts-I'm sure the teachers are going to be blown away with them. That is too cute. Musical beds was a game often played around our house when our children were younger. Awwww, SO sweet!! Congrats on the finisheS!! I just love that picture of your husband and son sleeping peacefully together in your little boy's bed. How precious is that? Those days are long gone in this house as my youngest of 5 sons is now 19, so I know how much you'll treasure this picture in years to come. The best part is knowing the size of my brother in law and the size of my nephew! You did a wonderful job on the teacher quilts this year and I know that all those who benefit from your generous gifts, will treasure them forever.